Boys football at NJFC has a history dating back to 1962 as Alphington Junior Football Club, commemorated with the “A.J.F.C.” on the back of our playing jumpers. 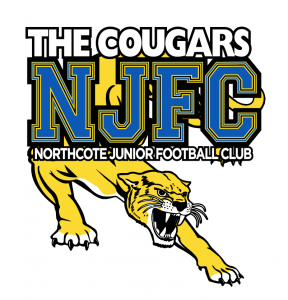 The club is affiliated with Northcote Park Football Club, where many of our players continue into senior football. Most boys start their junior football at Auskick aged 5 or so. As their skills improve they move into competition football generally at age 7-8 to play with their mates from school and other friends they have made through Auskick. Under 9 and Under 10 football is played according to the AFL Junior Match Policy, with no scoring. This starts at Under 11 level, when boys first have the opportunity to play for premiership points and may get the chance to play finals football. The focus in the early years in particular remains on player development and giving players the opportunity to play in a variety of on-field positions. From the Under-13s on, coaches may place more emphasis on the personal and team qualities needed to win games. Boys from eligible schools can nominate to trial for the School Sport Victoria (SSV) team to play in the Australian Championships each year at Under 12 (mixed) and Under 15 (boys) level, based on their age at 31 December of the previous year. This is a very competitive and self-funded program. More information can be found at SSV. Players identified at Under 13 level may be invited to join the initial NFNL Representative squad, and can progress through selection trials to play Under 14 and Under 15 representative football in the following years. NJFC falls within the Carlton and Northern Knights catchment areas. Talented players may also be selected for Carlton/Northern Knights Development Squads at Under 15 and Under 16 level, and the Northern Knights TAC Cup Squad at Under 17 level. The Carlton Next Generation Academy has additional programs to support talented boys with multicultural and/or Aboriginal and Torres Strait Islander heritage, generally starting from Under 13 age groups.